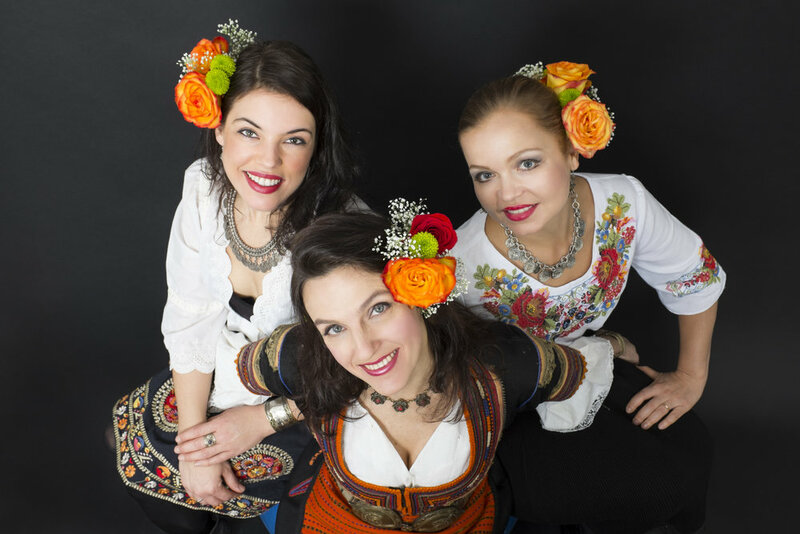 Vlada Tomova, known for her "phenomenal acrobatic vocalizations" (Boston Globe), joins with dynamic vocalists Valentina Kvasova and Shelley Thomas to weave together traditional Bulgarian village styles with artfully arranged a cappella songs and reveal the disarming power and intimacy of the unaccompanied voice. Their reinterpretations of ancient songs tell timeless tales of sweet or forbidden love, horses and wild mountains, potent wine, pepper planting, the secrets of the moon, and the sun’s falling in love with a beautiful girl and her song. Joyous, mysterious, mournful, exuberant, mesmerizing melodies; rich, unusual harmonies; and peculiar, odd rhythms come together to shimmer, intrigue, and delight the ear. The Trio's live performances include: Gathering Friends Festival at Moscow Conservatory; Lincoln Center, Joe's Pub, Queens Museum, Lincoln Center Out of Doors and The Golden Festivals in New York; Vancouver Island MusicFest and Hillside Festival in Canada, and Cumbre Tajin Festival in Mexico. Boston's Arts Fuse listed the Trio's concert at The Armory as one of the best live shows of 2014.